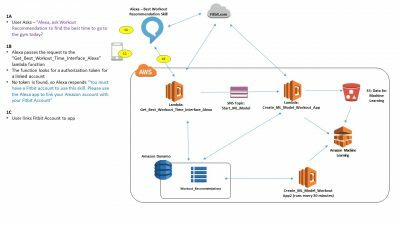 Integration with Alexa allows a user to obtain a workout recommendation (and create a machine learning model) all by voice command. After I was able to build a working model, I needed to come up a way to automate the model. I originally planned to allow access through my website, but decided to use Alexa in addition to the website link. 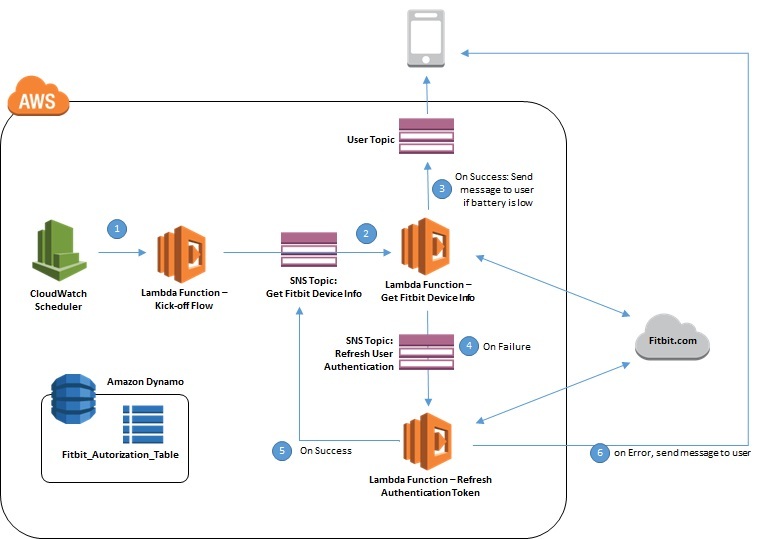 Note: The process of creating an Alexa skill isn’t too complicated (if you have experience building lambda functions). That being said, I suggest you start by building a sample skill – such as the Fact Skill example. Also, be sure to read and follow the certification requirements. 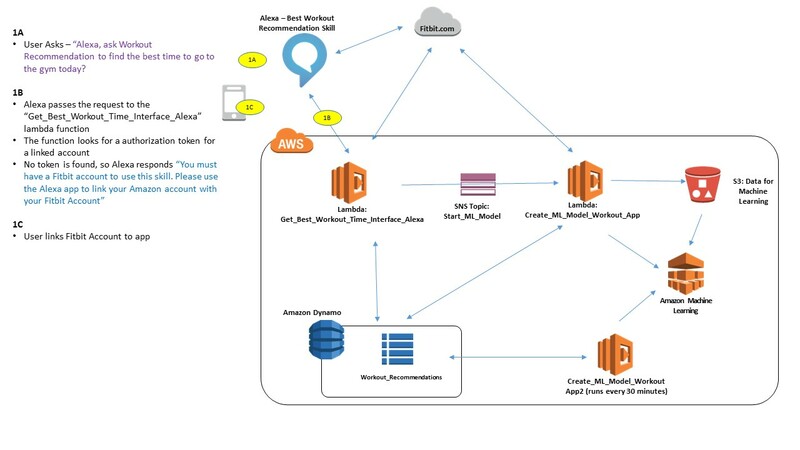 Alexa, AWS, and the exposed Fitbit APIs provided a mechanism to build a model and return results for a specific user – all initiated by voice. A user has to link his/her Fitbit account to the skill before s/he can (a) build a specific machine learning model based on their history and (b) get a workout recommendation. Step 1 covers the logic for this functionality. 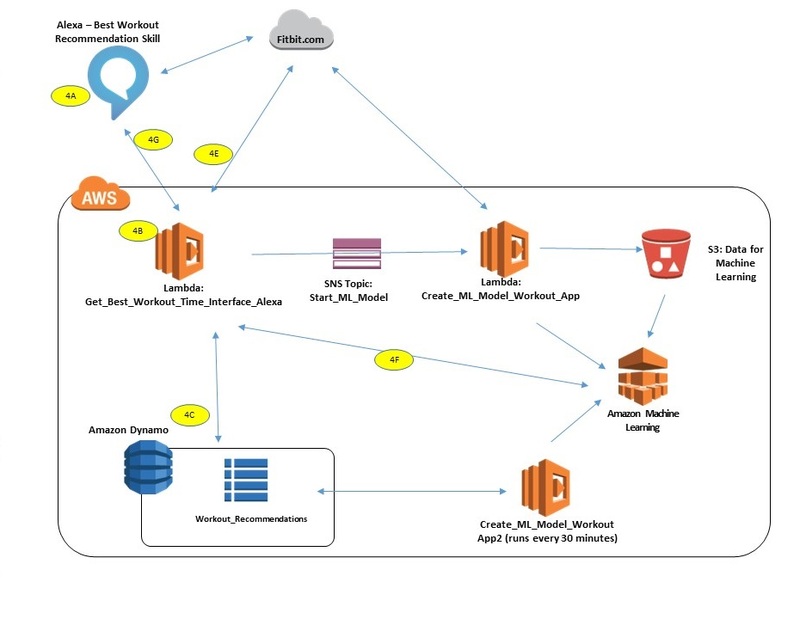 Amazon Machine Learning, leveraging activity data from a your Fitbit, can be used to predict workout intensity. When creating my prediction model, I first had to define workout effectiveness. Was it measured by the total number of minutes that I worked out, or my average heart rate? Should I consider my peak heart rate, or number of calories burned. 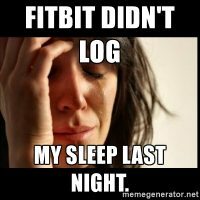 All Fitbit trackers calculate active minutes using metabolic equivalents (METs). METs help measure the energy expenditure of various activities. Because they do so in a comparable way among persons of different weights, METs are widely used as indicators for exercise intensity. For example, a MET of 1 indicates a body at rest. Fitbit trackers estimate your MET value in any given minute by calculating the intensity of your activity. From there, I needed to determine what inputs impacted workout intensity. After more reading, I landed on the following as inputs to a successful workout. My Fitbit tracks sleep and the amount of total activity of a given day (measured with the count of total active calories burned in a day). I can also get the start time of each workout and the resultant active minutes in that workout. Stress, being subjective, is harder to measure. I originally used the number of meetings in my outlook calendar to determine my level of stress, but found that metric to be inaccurate (at least, without additional research/tuning). 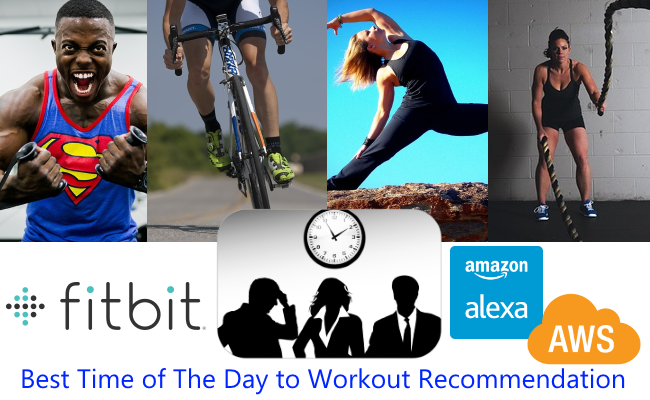 A simple application that uses your Fitbit data to recommend the best time of day to workout. A few months ago, one of my former co-workers1 published a brilliant post on Linked about using machine learning to predict his mood. It got me thinking – with all the data at my fingertips, what could – or should – I attempt to predict? I ultimately decided to focus my attention on fitness. 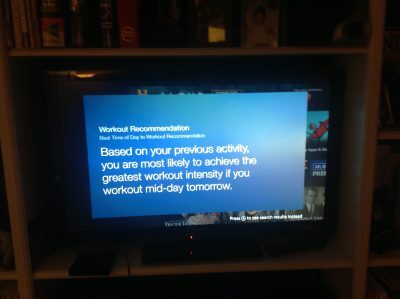 Specifically, I wanted to determine the most optimal time to workout on a given day. Why? 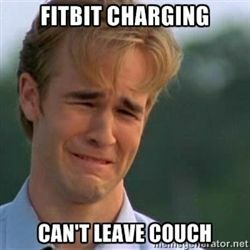 Well, when it comes to fitness, we live in a world of paradoxes. We have the best fitness information available, the most knowledgeable doctors, and affordable devices to track our health. We have the best workout options: gyms in every neighborhood; gyms at our offices; online and DVD courses to support fitness at home. We even have more flexibility in our schedules. Many people work from home at least once a week. Our gyms open earlier and close later. Our employers support and encourage an active lifestyle. 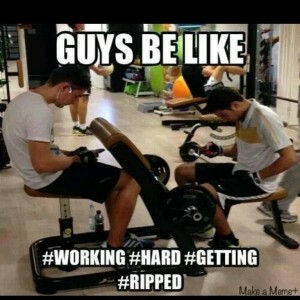 Yet despite this, people struggle to find time to work out. And when we do get to the gym, we are either rushed or distracted – so our workouts become less impactful to our overall health. I built my app to help myself, and others, find the most optimal time of the day to workout. Are my workouts more efficient in the morning? Or do I get better results by working out at noon? Each user is different, so I had to build the app so that each user’s prediction model was customized to their activities. 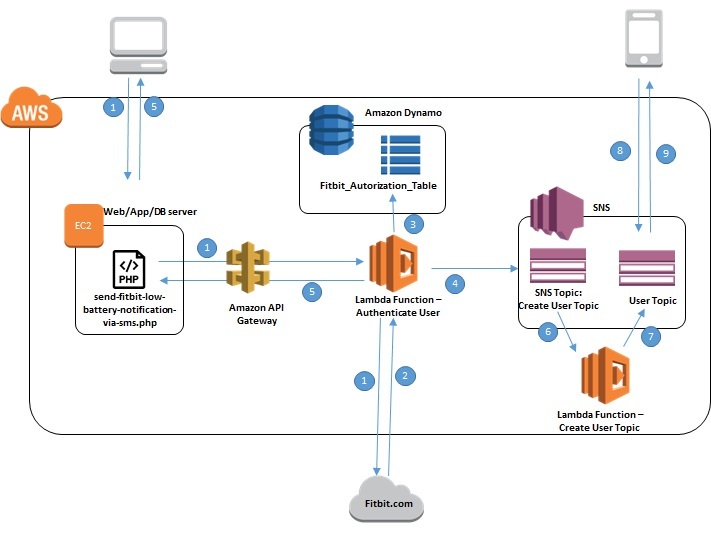 This was done by building a custom model for each individual user of the application. I’ll talk in detail about how I designed the machine learning model and how the app is architected in parts 2 and 3 of this topic. In the meantime, feel free to use the web based version of the app or the Alexa skill.